Even if it’s not Enyo, the new Bing-sourced Maps app comes with all of the same features, including location bookmarks and recent locations. Installation requires a restart of your devices and appears to completely override (overwrite?) the default Google Maps app. So if you’re a fan of Google Maps over Bing, you’ll want to avoid this update. If you don’t care where your mapping data comes from, just so long as it can tell you how to get from A to B, then go right ahead and download. 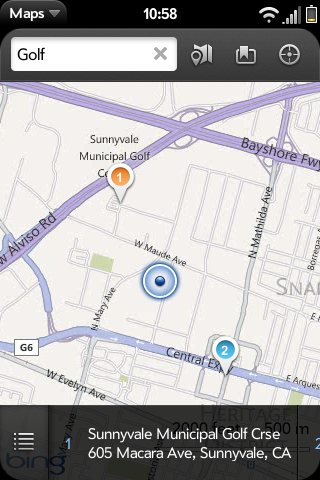 The new Maps app can be downloaded from the App Catalog – just search Maps. It's worth noting that Google will be deprecating the API used to create the webOS Google Maps apps, so it would stop working eventually anyway. A note of caution for those of you running unofficial systems (e.g. Pre with webOS 2.1, Pre 2 on Sprint, etc), it's possible this update could end poorly for you. Our own Sprint Pre 2 has been booting for fifteen minutes after this update (and that's after two frustrated battery pulls due in an attempt to alleviate the situation). So hang tight for now. It's worth noting that others have had success, so ours could be an isolated incident. Can't say that we're pleased to have our Sprint line out of commission, though.